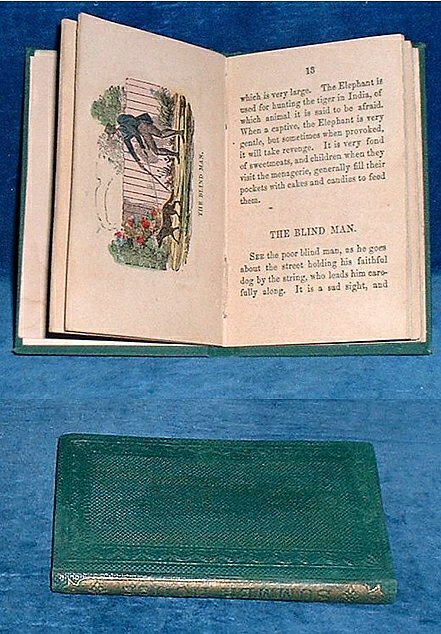 Description: Nes York, Leavitt & Allen 1865 approx Hand colored illustrations (14 full-page ) + hand colored titlepage vignette. . 110x70mm green blindstamped cloth spine overall gilt with title (tips rubbed) 16pp + 16pp (recte 15pp) easy very short stories for little children. Name to fly leaf (Arthur O'Connor Glen Falls N.J.) and slight paper tanning but clean and tight.